“15 Reality Checks on the Plan” from the Inner Arbor Trust. Click for high-resolution version. 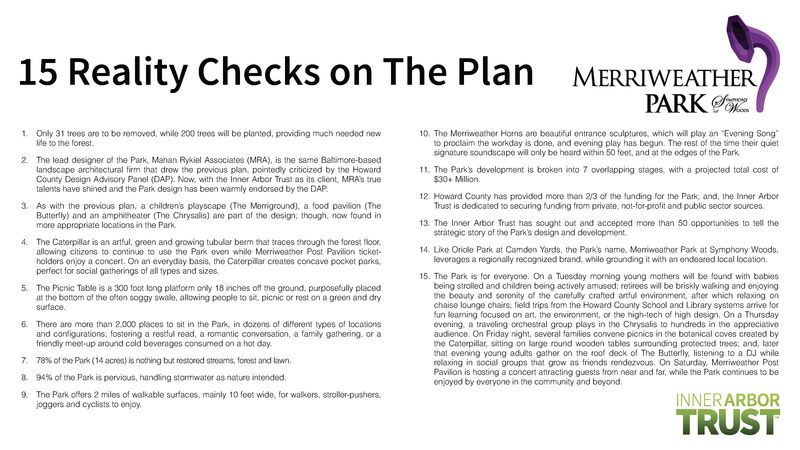 Adapted from “Merriweather Park at Symphony Woods: By the Numbers”, © 2014 Inner Arbor Trust; used with permission. Sacred lands and the facts don’t always get along. 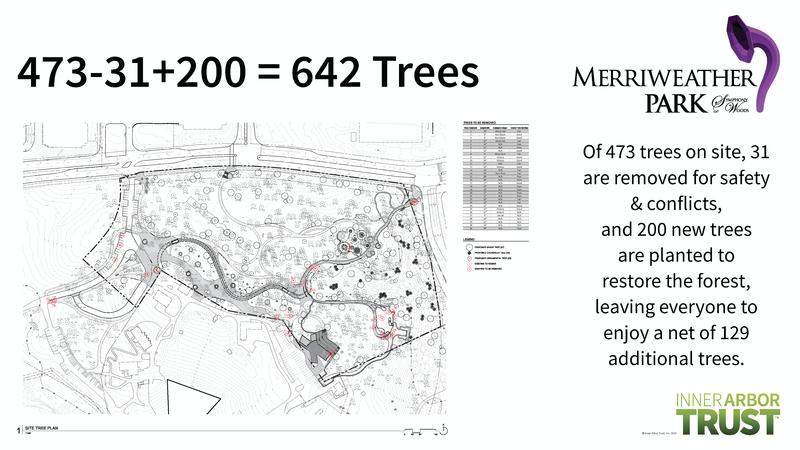 Recently the Inner Arbor Trust released a document (“Merriweather Park at Symphony Woods: By the Numbers” [PDF]) that attempts to correct misconceptions about the Inner Arbor plan. It’s a good document (though at almost 180MB it takes a while to download), and if and when I have time I’ll blog more about it in detail. However I suspect it’s also probably a wasted effort as far as many people are concerned: When people come to think of land as sacred they often stop thinking about the reality of the land as opposed to its sanctity, and the facts are then often ignored, overlooked, or distorted. Those who preach a land’s sanctity aren’t always saints. Going back to the example above, did people just happen to innocently get the facts wrong and decide a mosque was going to be built right where the twin towers stood? Well, no, not exactly. There were plenty of people who worked to actively spread this idea because they themselves stood to benefit if others believed it were true: news channels trying to increase their ratings, politicians trying to attract votes, advocacy groups trying to raise money, and so on. A map of the trees to be removed as part of the Inner Arbor plan. Click for high-resolution version. Adapted from “Merriweather Park at Symphony Woods: By the Numbers”, © 2014 Inner Arbor Trust; used with permission. This is all Jim Rouse’s fault, really. Recently Robert Tennenbaum, the former chief architect and planner for Columbia, quoted Jim Rouse’s words about Symphony Woods from the 1964 presentation “Columbia: A New Town for Howard County”: “Today a magnificent stand of trees, this 40 acre woods will be permanently preserved and cultivated as a quiet, convenient and strikingly beautiful asset of the town.” All well and good; however I think it’s also useful to consider what Jim Rouse did and not just what he said. First, as I’ve previously mentioned, Jim Rouse saw fit to put a large outdoor amphitheater smack in the middle of the “magnificent stand of trees” in question. Second, Jim Rouse also saw fit for the Rouse Co. to retain ownership of the Crescent property surrounding Symphony Woods, as opposed to deeding it to CA or to the county. Did he do this because he planned for that property to be “permanently preserved and cultivated as a quiet, convenient and strikingly beautiful asset of the town”? Given that Rouse was a canny and successful businessman, I presume instead that he did it because the Crescent was a potentially-valuable piece of centrally-located property that the Rouse Co. or its successors could at some point profitably develop for high-density office, retail, or residential use. 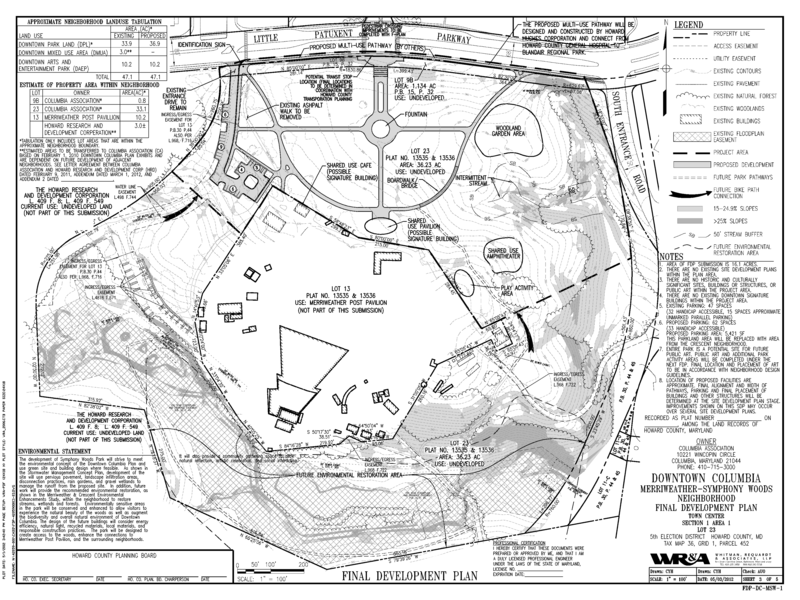 Cy Paumier plan for Symphony Woods showing park features proposed to be constructed. Click for high-resolution version. Image adapted from FDP-DC-MSW-1, Downtown Columbia Merriweather-Symphony Woods Neighborhood Final Development Plan. Being “Disneyesque” is not necessarily a bad thing. One of the persistent charges against the Inner Arbor plan is that it is “Disneyesque” and turns Symphony Woods into an “amusement park” with “attractions” (in scare quotes) unsuitable for the wooded setting. This seems an odd accusation for several reasons. First, as noted above the Paumier plan had pretty much the same set of “attractions” as the Inner Arbor plan. Second, given that Jim Rouse was apparently quite the admirer of Walt Disney—he said in 1963 that “the greatest piece of urban design in the United States today is Disneyland”—I suspect he would have thought the term “Disneyesque” to be more a compliment than an insult. In fact, I’d go so far as to say that preserving Symphony Woods for future generations to enjoy will require more than a bit of the same sort of design thinking that went into Walt Disney’s theme parks. In particular, once the Crescent property is developed the remaining area of Symphony Woods is going to seem relatively small: the Inner Arbor plan preserves almost 80% of Symphony Woods as a natural wooded area, but that’s still only 14 acres or so—about the size of a small subdivision in western Howard County (land of 3-acre lots). A prime task is then to make Symphony Woods seem bigger to visitors than it actually is—the same problem faced by theme parks like Disneyland, and one that their creators did a good job of addressing through artful design. Walkable paths and roads in the Inner Arbor plan. Adapted from “Merriweather Park at Symphony Woods: By the Numbers”, © 2014 Inner Arbor Trust; used with permission. The Paumier plan with its straight paths does a poor job of this in my opinion; in particular the main path through the park makes it glaringly obvious how short the distance is from Little Patuxent Parkway to Merriweather Post Pavilion. 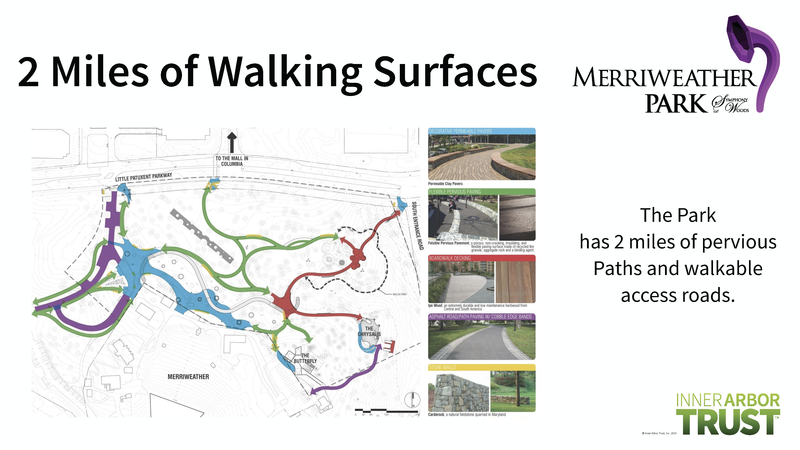 The Inner Arbor plan instead has lots of “meandering paths” (as called for by the Howard County Planning Board after the Design Advisory Panel found fault with the Paumier plan), together with access roadways forming about two miles of walking surfaces within the confines of the park, and featuring over two thousand places to sit along the way. But I suspect people will probably prefer to walk than to sit, since as with the best theme parks walking will continually bring new sights to visitors’ attentions, between the natural beauty of the woods and the various attractive park features. That concludes my thoughts on Symphony Woods, at least for now. I hope to come back later with more thoughts on the Crescent development. 1. I’m as culpable as anyone else when it comes to not letting facts get in the way of my emotions and convictions. A few blog posts back I wrote that some people seemed to oppose the Inner Arbor plan because “Jim Rouse (or one of his disciples) didn’t propose [it]”. Soon afterward Michael McCall wrote me and politely pointed out that he had worked for Jim Rouse for many years; in other words, one of Jim Rouse’s disciples was in fact behind the Inner Arbor plan. I actually knew McCall had worked for Rouse, but I was so invested in the narrative of forward thinking vs. “What would Jim Rouse do?” nostalgia that my mind conveniently forgot this particular fact. 2. The Inner Arbor “by the numbers” document lists the total number of trees to be cut as 31, at least half of which are not considered to be in good condition; see the full document for a complete list of exactly which trees are proposed to be removed, their species, and conditions. Contrasting this to the original plan, Cy Paumier wrote in July 2012, “Between 50 and 60 trees will need to be removed to construct the Symphony Woods Park walkways.” According to testimony at the Howard County Planning Board hearing on the plan, also in July 2012, up to 64 trees could be removed, or a bit more than twice the number proposed to be removed for the Inner Arbor plan. Note that unlike the Inner Arbor plan these figures do not appear to account for any trees to be removed for the shared-use pavilion, shared-use amphitheater, play area, and other park elements proposed in the CA documents submitted to Howard County. This entry was posted in howardcounty and tagged crescent, innerarbor, merriweatherpark, merriweatherpostpavilion, symphonywoods on April 11, 2014 by hecker. Frank, thank you for your outstanding posts on the Crescent, Symphony Woods, and downtown development in general. They have been very helpful to me in understanding the various parts of the plan and how they fit together. Terrific work! Thanks much for reading and commenting. I’m glad you find these posts useful. I’m retired, but I don’t have as much time as you for this stuff, thank you for what you do. More of my thoughts on your five, from a “true” Columbian (I was a Columbia planner for Rouse from 1965 through 1975). My concern, however is not “what would Jim Rouse think,” but what will work in Columbia. Symphony Woods is a relatively small park in an area which is urbanizing. It surrounds the Merriweather Post Pavilion, which visually and topographically is a part of the Park (more on that later). What do people want in relatively small urban parks? Trees, shade, bird habitat and a beautiful vista; Lawn, someplace to lie in the sun on a beautiful Summer day and get a few rays; Benches/chairs, some of us are better off sitting on furniture than the lawn; a Water feature, shallow pools and fountains are people magnets, and many are being designed for active use, not just visual; and finally, a Place to get an espresso, a glass of wine (I wish) and a snack sandwich or a sweet (is gelato too much to ask for). While I’m not advocating for “Cy’s Plan,” it seems to fill those requirements. It appears to me that the Inner Arbor Plan misses the boat on almost all counts. Its elements are active not passive, they are overly clever (I believe that I have used Disneyesque), more amusement park than urban park. In order for the Inner Arbor elements to succeed, people will need to drive there, they are not designed for the surrounding (or soon to be surrounding) population. And finally (for the Inner Arbor) they are outrageously expensive ($30 mil. or so?) design gimmicks that will be extremely expensive to maintain. But for me the clincher is that they are a distraction from the Frank Gehry designed Pavilion which in another few years will be eligible for landmark status. The Pavilion is an early Gehry building and represents his attraction to and appreciation of the minimalist art of its time. Unfortunately, the Pavilion has been badly maintained and it need a thorough restoration. The outbuildings on the site are abominable and should be removed and replaced with well designed facilities. If I were a wealthy donor, I would be happier donating money to restore a historic landmark than to the development of a “picnic table” or “caterpillar.” The interface between the Pavilon and the Park needs to be redesigned, your fear of guards at the chain link fence should not be the feeling a Park visitor is given. The land just outside the fence does relate to the Pavilion and the land inside the fence relates to the Woods. I believe that keeping Symphony Woods as an urban park which is enhanced by the Pavilion and is the appropriate setting for the Pavilion is the appropriate solution. For that to happen, the designers need to work together, not separately. And finally, the design of the Crescent and the Tobey’s property along the South Entrance should be considered at the same time. I’m afraid that that, however, would take the vision of a Jim Rouse. Thanks again for commenting! (Although if you keep leaving such long comments I’ll have to set you up with your own blog 🙂 I’ll likely address most of these points in a future post, but to comment quickly on a couple: First, as I understand the Inner Arbor plan, it has all the elements you mention, including a cafe, a fountain (proposed as part of a plaza on the Merriweather property as opposed to in Symphony Woods itself), and lots of standard-type benches along the pathways (per the “by the numbers” document) in addition to the Picnic Table feature. Second, I’ll respectfully disagree about the Inner Arbor structures detracting from Gehry’s pavilion. I think the much greater distraction is the motley collection of structures that you mention, the ones surrounding the pavilion on the Merriweather property itself. Based on my walk I suspect the topography is such that the Inner Arbor structures would not be that visible from the pavilion proper, or vice versa. In any case, I’m on vacation this week, hence the many posts; expect two or three more before I’m done.